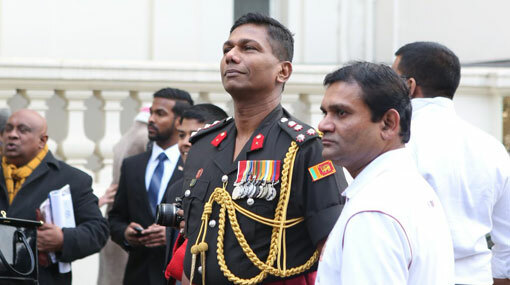 President Maithripala Sirisena has revoked the suspension of Brigadier Priyanka Fernando from duties as the Minister Counsellor (Defence) attached to the Sri Lanka High Commission in London, Army Commander Lieutenant General Mahesh Senanayake said. He stated that the Sri Lanka Army (SLA) has sent a letter to the Brigadier seeking justification for his actions during the incident. The army will provide its fullest support to any inquiry initiated by the Sri Lankan High Commission in UK regarding the incident, he told Ada Derana. However, suspending him from services without an inquiry is unacceptable, he added. However, he said that the President has revoked the suspension and has ordered to reinstate the Brigadier to the position. Sri Lanka’s Ministry of Foreign Affairs had announced that the Minister Counsellor (Defence) was suspended with immediate effect and that inquiries will be initiated into the alleged incident involving him. A video had appeared on social media depicting Brigadier Priyanka Fernando making certain gestures aimed at members from the Tamil community who were engaging in a protest outside the Sri Lankan High Commission in London on Sunday (4), as Sri Lanka marked the 70th anniversary of independence. “Authorities in Sri Lanka have taken serious note of videos being circulated on social and web-based media of an alleged incident involving the Minister Counsellor (Defence) attached to the Sri Lanka High Commission in London behaving in an offensive manner,” the ministry said yesterday. In this connection, instructions have been sent to Sri Lanka’s High Commissioner in London on Tuesday (6), to suspend the Minister Counsellor (Defence) from work, with immediate effect, the release said, adding that authorities in Sri Lanka including the Sri Lanka Army will initiate inquiries on the incident immediately. Two British Labour Party MPs had written to the UK’s Foreign Secretary calling for the withdrawal of the diplomatic papers and expulsion of Sri Lanka’s Defence Attaché in London, Brigadier Priyanka Fernando, over his “attempt to intimidate” a group of protesting Tamils. “This is inappropriate, unacceptable and threatening behaviour, from someone who is serving in an official capacity as a guest of this country,” Labour MPs Joan Ryan and Siobhain McDonagh said, in a joint letter to Britain’s Secretary of State for Foreign and Commonwealth Affairs, Boris Johnson. The Labour MPs urged the Foreign Secretary to make immediate representations to Sri Lanka’s High Commissioner about this matter and also requested that he withdraw Brigadier Priyanka Fernando’s diplomatic papers and expel him.